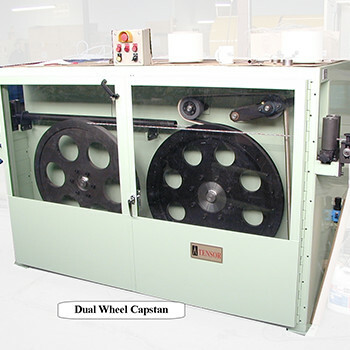 Capstan - Dual Wheel | Tensor Machinery Ltd. The Dual Wheel Capstan is the main capstan used for the SZ Stranding lines and some Jacketing line applications. This style of capstan is preferred for crush sensitive cables since the pulling wheels don’t require the higher belt pressure that a tradition caterpillar capstans may require. The dual wheel capstan acts as the master reference for the rest of the line. Two aluminum wheels with a 800mm diameter are used. One wheel is driven and is enveloped at 160 degrees with a 3 or 4″ wide polyurethane belt. The belt is tensioned with an air cylinder. The wheels are U shaped and are hard coated to protect from wear. Adjustable guide rollers ensure that the cable enters and exits the wheels in a straight path. The capstan is driven with an AC Vector Motor and gearbox configuration. A multi-channel digital encoder can be mounted with the capstan for length and speed feedback.